Fun and free to play Seas of Gold is a rich RPG with story driven content where players can live out the life as a captain of their own ship, sailing around the world to fight off pirates, ghost ships and various terrifying sea monsters. Accessible through your preferred web browser the game offers some casual gameplay elements with a simple linear quest line and multiple features unlocked as the player gains XP and levels up their character. With crafting, PVE, PVP, Pets and Legions the game is a feature packed colourful title with impressive 2.5D browser graphics. The fundamental gameplay aspects are about trying to build up the strength of your Captain and Fleet to improve your Power score, this allows players to take on more dangerous threats in the world that grant higher rewards. There are numerous quests that can be picked up which will follow a few storylines that players can complete that will grant various rewards and XP to level up. Players are responsible for upgrading their captain in three key areas: Ship, Skill and Fleet. The Ship is where they can equip a new ship to the player Captain (and Fleet Captains) to control, which must be equipped with items that fill the six main ship areas such as the figurehead, cannons, deck and more. Skill unlocks new powerful abilities that are used in battle and are acquired through the use of Skill Books, making the captain considerably more powerful. Finally the Fleet, the accumulation of other Captains to fight alongside the captain. In the Tavern players will find a roster of available Captains to recruit by spending rum, brandy and whisky to acquire captains of various qualities, each with their own role in combat, skills and ship; they are managed and maintained much in the same way as the players own Captain. Players will progressively unlock more Fleet Captain slots as they level up, allowing them to field a larger part in combat to assist them. Battles typically happen in instanced environments where the player and their fleet go head to head against various NPC enemies to try and destroy all the opposition in turn based combat. 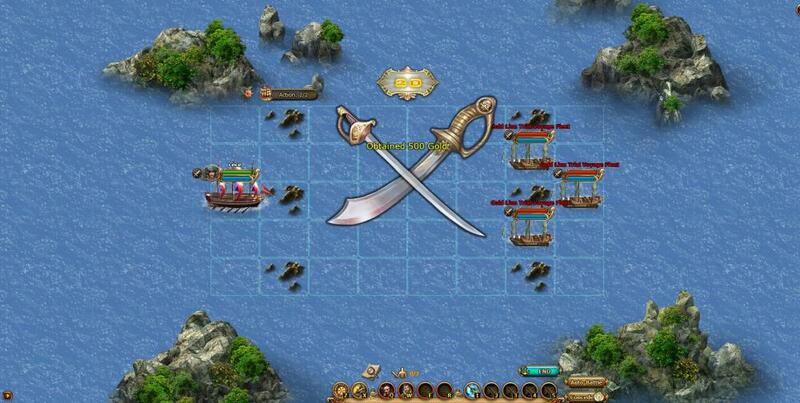 Starting at each end of a map that is broken down into different squares, players can take turns to move their ship around (the number of squares they can move is determined by the ship type) and try to make attacks on the enemy, their range and power determined by various factors with the ships upgrades. Player Captains have the ability to call on their recruited Fleet Captain's for help, who each have their own ships, stats and skills and are automated in the battle as they try to take out the enemy. As players get further into the game they will find more objectives other than simply killing all the enemy ships, including capturing and holding a point during the battle for a set number of turns. If players wish they can even activate Auto-Combat to let the AI control their own character as well. The Arena is the place to PVP, by default players have ten chances to challenge a player and will earn rewards for their victories but also the rank that they are able to keep, unlocking new prizes for daily rank and weekly rank. Challenging a player takes their Fleet and has it be controlled by the AI, so PVP is still in some ways more like PVE but against a team that a player has built. 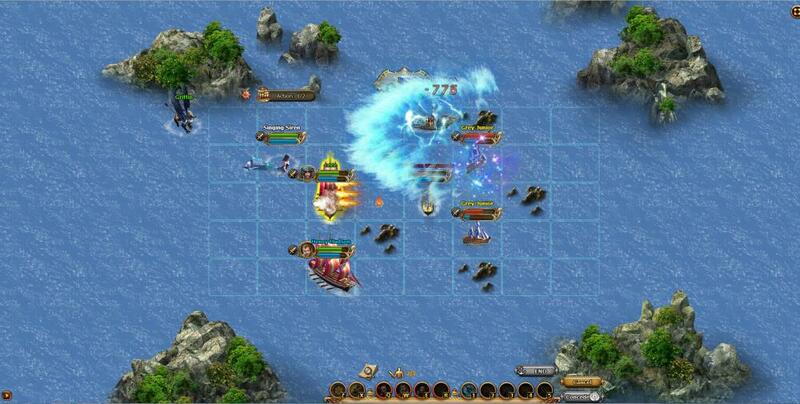 The game features a large number of events and activities that the player can take part in, from fighting world bosses for loot, or logging in daily for rewards, spinning wheels in games of chance, these activities unlock at certain levels and are sometimes only available at set times during the day.